RAL are the UK's leading supplier of great value display boards. 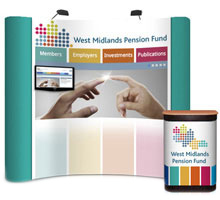 Based in Leicester, we stock a range of great value portable modular and folding display kits and office screens with next day delivery on stock colours. 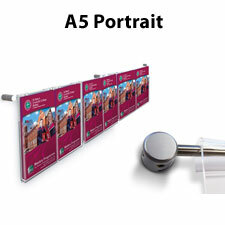 All Pro-Fold and Pro-Link display stands are covered by a 5 year guarantee against manufacturer's defects. All of our products are manufactured to the highest standards. Exhibition display boards are lightweight and portable and conform to strict fire regulations. 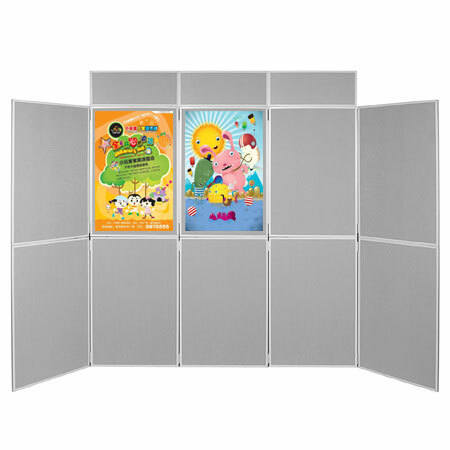 The standard folding kit and modular panel-and-pole display boards have a recess on one side of the exhibition panel to allow posters to sit within the frame. The reverse side is flush to the frame allowing oversized posters and graphics to be positioned across them. 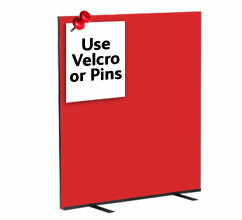 The boards are available in a large variety of Velcro friendly fabric covers and a choice of either grey or black frame. All display boards can be supplied with bags or hard cases. Irregular sized panels can also be accommodated. Why Buy Display Boards From RAL Display? The most simple format is the folding display kit where the exhibition display boards are joined using hinging strips. They are straight forward to erect as the panels are already supplied in the correct positions. 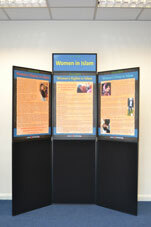 The top section of boards are lifted up and out and clip firmly onto the corresponding bottom exhibition display boards. They are supplied in sets of 6 to 10 panel formations with the option of integral tabletops. 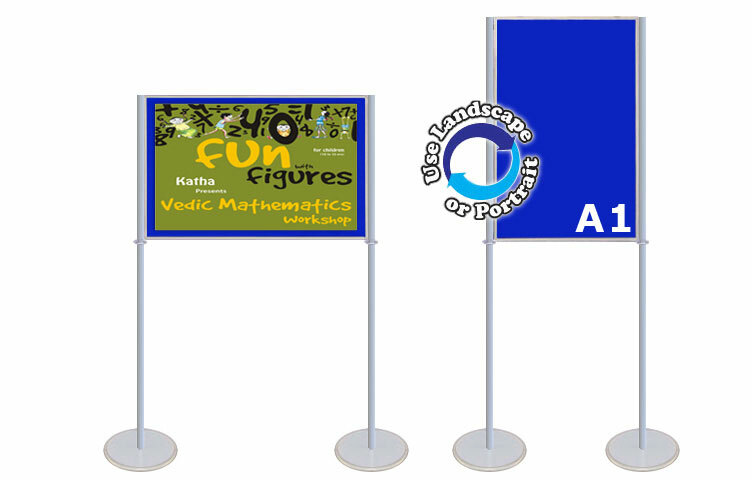 We offer smaller Mini and Maxi tabletop exhibition display boards for smaller shows. Our large exhibition display boards range is for permanent exhibitions with panel sizes of 1800 x 900mm and 2000 x 1000mm. Folding exhibition stands may be converted into modular displays at a later date by removing the hinges and replacing with clips and pole connectors. The alternative linking option is the panel-and-pole modular panel display kits. The exhibition display boards are joined with a pole connector which gives the flexibility of adding and removing display panels to form different stands. An important feature with the these is the ability to position the panels in either a landscape or portrait position. The panel clips are rubber-lined allowing the exhibition display boards to grip the poles and remain in a suspended position. The exhibition boards are available in two standard sizes: 900 x 600mm and 1000 x 700mm. 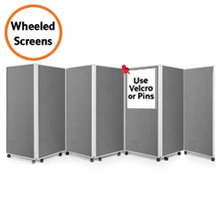 However, modular exhibitions are unrestricted by hinges so exhibition display boards of various sizes can be used to create customised formats. 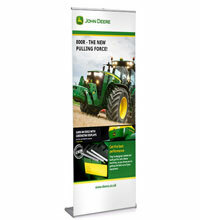 Heavy duty exhibition display boards are available to organisations who have a continuous use for exhibition equipment. For instance, conference organisers or universities who need an exceptionally hard wearing board for long running events may benefit from our polyweave panels. Please contact our sales team for a quotation. Free standing plinths, cupboards and workstations may also be created from the exhibition display boards. Cable apertures, cupboard doors and knee hole panels can also be featured within modular stands. 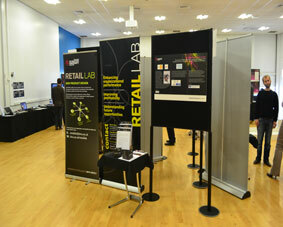 RAL Display provides a full exhibition hire service. We hire a range of exhibition display boards of various sizes, with a choice of two colour options. Display panels are royal blue on one side and light grey on the reverse. We have a selection of exhibition accessories to compliment them such as spotlighting, square and triangular tabletops, ladder racks and freestanding plinth units. Exhibition equipment can be collected directly from ourselves or arrangements can be made for RAL to deliver and install. Review: The Sales team are extremely helpful and our orders arrived promptly and in great condition. Very happy! Review: I found the service from the staff at RAL Display to be not only extremely efficient but carried out in a professional and friendly manner-even after my inundation of silly questions. We bought display boards for an exhibition and our management were extremely happy with the quality of these and lead time on our order. We will be a return customer in the future. Review: We are really pleased with our display boards for the library service. They need to be strong enough to stand up to displays being changed often, but light enough to carry round to different venues. These are ideal as the layout is flexible as well. And the service has been excellent – thanks! Review: RAL-Display provided a quick, friendly and efficient service and I’d be very happy to go back for other products. Our customers rated our Display Boards as 4.8 out of 5 from 5 reviews.